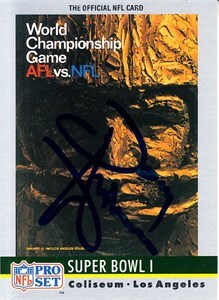 1989 Pro Set Super Bowl I logo card autographed in blue marker by former Green Bay Packers star running back Donny Anderson, who scored one of the touchdowns in their 33-14 rout of the Oakland Raiders. With certificate of authenticity from AutographsForSale.com. ONLY ONE AVAILABLE FOR SALE.